You have﻿ to be religious to dislike this. This is the way phisic should be taught. Thanx. Great watch. 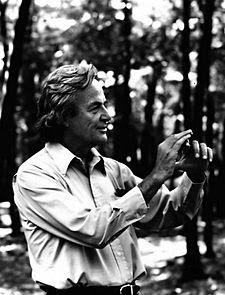 Judging from the materials online Richard Feynman is a fascinating lecturer capable of taking his audience to very difficult subjects in Physics. In my own humble writings on science and religion I try to be very careful not to mix nature and grace. In other words, I accept the Biblical view that what can be known about God by every person is obvious. But God has made Himself an object of faith rather than seeing. Faith has its own eyes and not every man or woman believes in God. Accordingly, science operates in the sandbox it defines for itself different branches building each its own set of ground rules and chessboard, so to say. So in my thinking I let science search for the truth freely according to its own rules of game. Faith in the God of Israel is not a shortcut to knowledge and in modern scientific world religious background is not a defining factor for the scientist. I have the uneasy feeling that professor Richard Feynman is doing the opposite from the other side of the fence of religions. He is mixing nature and grace in the way he uses scientific argumentation to attack the image of God he has built in his mind. In this his argumentation is somewhat similar to that of another brilliant scientist, Richard Dawkins.